You know what’s great about belts? They add both function and flair to any outfit. Think about it! Belts are champion for holding your pants up (much cooler and functional than suspenders…whatever happened to those guys, right? ), they accentuate your figure, they can hold stuff for you (freeing your hands for important phone calls and/or air guitar solos), and if you’re playing the game right, they can also announce just who you are and what you’re about. You don't even have to talk - you can just let that sweet belt buckle do all the speaking for you! Take, for instance, this authentic Batman Belt - Batman Utility Belt Accessory. First, try to imagine Batman’s costume without the classic belt buckle jutting out from his black form, front and center. Kind of lame, right? Like, an all black bat costume is cool and mysterious and all, but any New York club kid worth their salt can pull off that look. It takes a real superhero to add a bit of flair to all that darkness, and this belt is it! 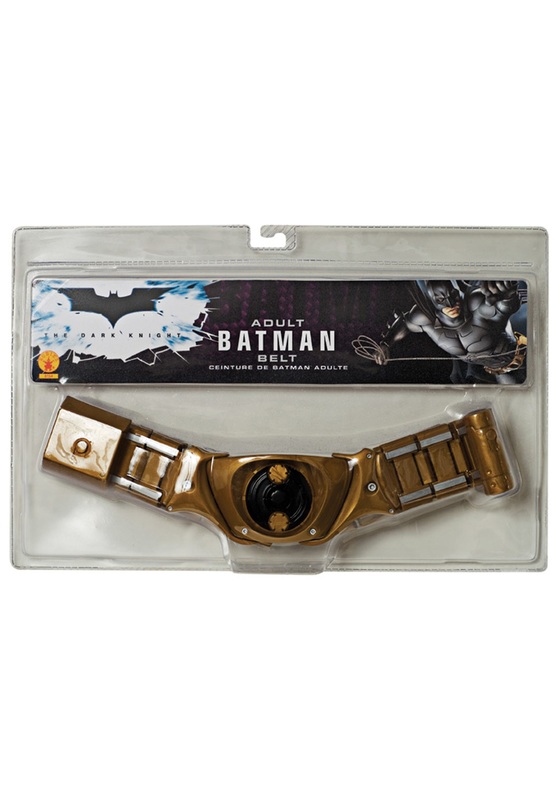 The plastic gold shaded belt has a Velcro strap in the back, which will make you feel safe and secure even when Gotham City (and probably the entire universe) is at peril. Gold links with silver accents are also included, which just elevates the whole thing to a new level of fun and fashion (which you might not care about, but the rest of us who have to look at it certainly do). So get at what is arguably is the most powerful part of the Batman ensemble - and keep those bat pants hiked up high - by wrapping this Batman Belt around your waist for a superior superhero touch!